Hi everyone. 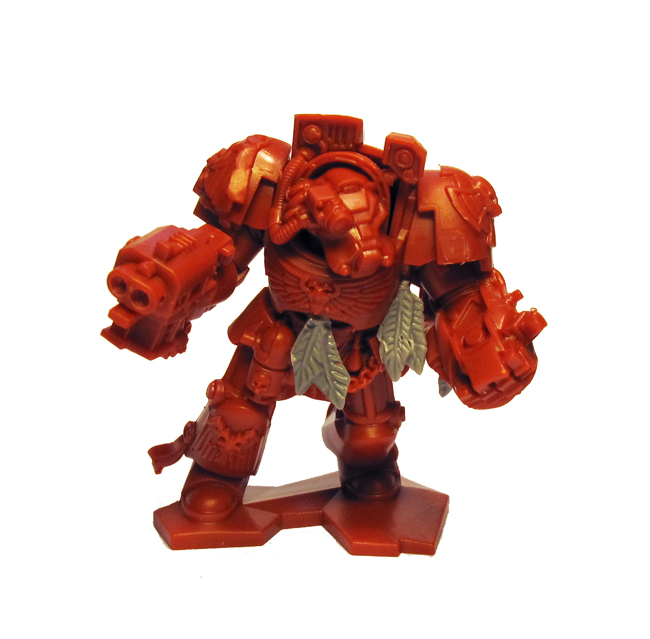 Here is my first article about how to paint a Space Marine vindicator in the colours of the Blood Angels. As I said, it is my first article here, but hopefully it might still be of some use to people. I painted it up before doing the article, so I have some Paint illustrations to help. In late June I began to build a space helicopter for my Imperial Guard, mainly as a display piece. 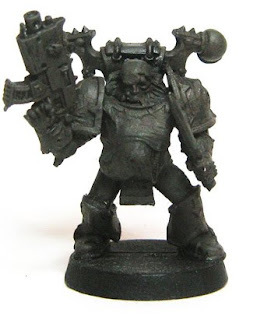 This tutorial covers the general process of painting a basic bone coloured Deathwing Terminator for your Dark Angels army. The same technique could be applied to painting any bone coloured model, not just a Deathwing terminator, but as I'm currently working on a bunch of them it's the one on the painting table today. Step 1: After Cleaning and assembling the model I’ve given it a thorough priming with a bone coloured primer. If you don’t have a can of bone coloured primer handy you can achieve the same coverage by using an air brush, or simply prime the model white and then with a large brush paint over the entire model with bleached bone. I’ve made sure to prime the model with several coats consisting of short controlled bursts on all sides, this allows for greater coverage and a smoother finish. Two thin coats of primer should be adequate, just make sure to allow each coat to completely dry before applying the next. Step 2: Glaze the entire model with Griphonne Sepia Wash. Make sure that your brush isn’t overloaded with the wash to prevent pooling, to do this simply run the brush along the lip of the paint pot to be rid of any excess. This may take some trial and error to get the correct amount of wash on your brush, but have patience. Step 3: With a large brush (I used the basecoat brush) clean up the model, and pick out the raised areas with bleached bone. I also highlighted with broad lines around the edges of the shoulder pads and the tops of the knee pads/grieves. In this step these general highlights will determine the general locations of further highlights. Step 4: Paint any areas of the model that are to be black, grey or nmm with fenris grey. This will serve as a colour guide for the model and a general base coat for these areas. If you get any grey paint on the adjacent bone coloured areas don’t worry you can go over any touch up areas with bleached bone after you’re done painting the grey. For this article, I have painted Telcharion from Enigma’s ‘Massive Darkness’ range. I thought it might make a good article figure, because it is fairly simple, with clearly defined parts – I chose to focus on the painting of the flesh, the robes, and the apron. I also recorded and explained the construction of the base. 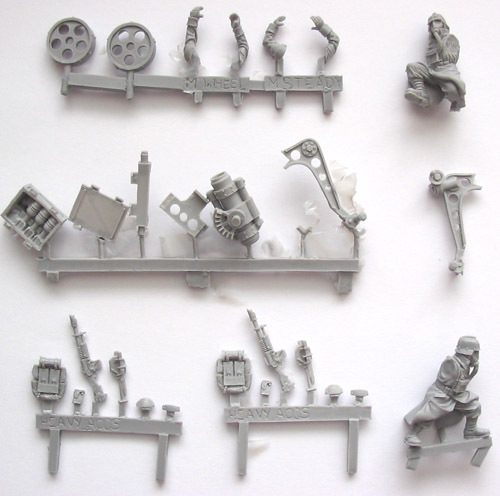 As I have mentioned in previous articles, I think it is worth putting a little time into the preparation of a figure, before the painting begins. Creating a nice, smooth surface with which to work makes life a lot easier, and less frustrating, when it comes to painting, meaning a little extra time at this prep stage can save a lot of headaches later. After removing the mould lines carefully by scraping with a scalpel, and filing any particularly rough bits with an assortment of needle files, I used sandpaper (400-800 grade works well) to gently smooth out any other areas that remained rough. After this, I scrubbed the figure with a wire brush – be careful the bristles are not too hard; mine has brass bristles I think, but if you use one with bristles that are too hard, they will scratch the figure and ruin it. Test a new brush on something unimportant first! After this, you can use a toothbrush and wash the figure in warm soapy water, to remove any oil or dust from the surface before paint is applied. This scrubbing with the brushes is what makes the figure shiny and gleaming (sort of!). If there is any pitting or cracks in the cast, these can be filled in with a liquid putty, or with milliput mixed with water to create a sort of 'wash'. This wash can be painted liberally over the figure, allowing the milliput to settle in any depressions or marks, resulting in a smoother surface. It can also be gently sanded once dry, if necessary. I find that milliput standard (yellow-grey) works best; I find it a lot easier to work with, than the superfine versions, with which I have encountered problems. You can see the figure is standing on a champagne cork in all the following WIP photos. I always paint my figures like this, because I find it a lot easier to hold this way. I drill a hole into the bottom of each foot usually about a centimetre deep, and insert metal wire into each with superglue. Leaving 2 or 3 centimetres protruding from each foot allows the wires to be stuck into the cork to hold the figure, and later, they are used to attach it securely to the base. For this figure, I also made a few little adjustments to the face, using a putty mix of greenstuff (a.k.a. duro or kneadatite) and milliput. I mix milliput with the greenstuff, because I find it easier to create a smooth transition between the metal and sculpted areas; also, it means you can sand the putty once dry to be sure it is smooth. These little changes to the face weren’t strictly necessary, merely a personal thing – I just wanted to slightly reposition the brows, mainly. It was a small adjustment to sharpen the facial features a little. After undercoating (I used Tamiya Surface Primer spray, which is a mid-grey colour – you can see it on the hammers in the following photos), I painted the base colours onto the main areas of the figure. I find it helpful to paint the bulk of the base colours first, because it lets me get a preview of how the various colours might work together, and helps me make decisions about the main colour scheme. I usually work out the basic colour scheme I want to use before I start painting, but after painting on the base colours like this, I often change my mind about a particular colour once I see it against the other colours in reality, on the figure. I like to use quite high colour contrast when painting fantasy figures, because I think that exaggerated colour, lighting and contrast suits the ‘hyper-reality’ of the fantasy world. I think it is worth pushing beyond what might be ‘realistic’; realism has its place, and certainly, when painting historical figures a realistic style might be more appropriate. But the whole point of fantasy lies in its exaggeration of reality, so in my view, it is good to take this opportunity to create a figure with a bit more ‘impact’. I think fantasy is more about strong visual ideas, rather than creating something that looks real. With this in mind, I used a few different methods to create contrast within the colour scheme chosen for this figure. First of all, there is a contrast between warm and cool colours: the ‘coldest’ colour present on the figure is the strong cyan colour of the pants, belt and arm straps. This cyan is balanced against the warm, light orange tones of the flesh, and the warm, dark-orange-brown of the apron – cyan and orange are opposites on the colour wheel. The yellow-green of the robes, and the dark red-purple of the boots and other little leather components, are also opposites, both colours lying in-between the warm and cold ‘poles’ of the cyan and orange, and thus perform the role of supporting colours, balanced against each other. In combination, these colours create a sort of ‘quadratic’ colour scheme, with all 4 hues creating an even spread of hues around the colour wheel, and hopefully a balanced scheme which is pleasing to the eye. Here’s a little pictorial representation of what I am talking about, with the basic colour palette spaced around a circle representing a colour wheel. Please excuse the roughness of the pic – it's just a quick one to try to show you the main ideas, so excuse the inaccuracies. The cyan is opposite in hue to red-orange, so they are on opposite sides of the circle. The yellow-green and red-purple hues are a little closer in hue to the orange than the cyan, which is why they are spaced a little further towards the orange on the circle. This is compensated for by the fact that the cyan is the brightest, or most ‘saturated’ of all the colours in the palette, and this extra brightness means it has more ‘weight’ in the scheme – it can balance against all the other colours. Another way by which contrast is created with the colour scheme, is the balance between light and dark areas on the figure. I tried to make a conscious effort to have a wide range of colour ‘value’ across the figure; that is, rather than using colour that all lie within a mid range of light-dark value, I used areas of very dark colour, such as the apron, hair and purple leather parts, against much lighter areas, such as the flesh. This created a more dynamic look for the figure, with the added value contrast. Contrast can also be created by using a wide range of ‘saturation’ or brightness between colours. So, for example, on this figure, there are some very saturated colours, such as the cyan pants, belt and arms straps, and parts of the green robes. Setting these colours against much less saturated, more neutral parts, such as the apron, hair, hammers, and most of the base makes them seem even brighter. If too many strong colours are used in a colour scheme, I think their impact is reduced – saturated colours will compete against each other for attention, and maybe cause a bit of a ‘colour clash’. So I think it is important to remember to have some fairly neutral areas, even when painting in fantasy style. After the base coat, which was a mix of P3 Midlund Flesh, P3 Rucksack Tan and GW Fortress Grey, with a touch of P3 Menoth White Highlight, the first step was to begin identifying the shadows. Using a red-orange colour, I painted a series of thin glazes in the shadows, giving the flesh some colour. Then, I continued the shading, using a darker red-brown colour to further emphasise the volumes. It is important to always keep in mind the direction of the light source – you need to have made a clear decision on the direction from which the light is falling, in order to maintain coherence with your shadows and highlights. In this case, I am using top-down or (‘zenithal’) lighting, which is the most common and the easiest to visualise. Just imagine the light falling onto the figure from directly above, as if someone was shining a torch down onto the figure. Next, I emphasised the shadows even further, introducing a little dark green-blue into the darkest areas. Because it is applied in thin glazes, the colour does not show up as anything too obvious, but it does add some depth to the overall colour and appearance, in my opinion. At this point, I started to apply some highlights. 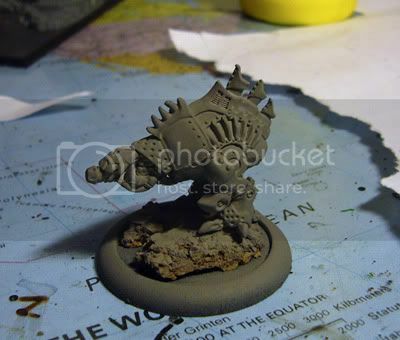 First, I neatened any rough-looking areas with some glazes of the original base colour to blur the blending a little. Then, I mixed P3 Menoth White Highlight with the base colour for the first stage of highlighting, and some touches of pure Menoth White Highlight. I also added a touch more of the dark green-blue in the deepest shadows. Alrighty now. Here we go. First article I've made for any site, hopefully you all find it useful in some way so please please please comment on it once you finish going through it. Here's the concept. The undead march at night. Not in the morning. Not at noon. Not at tea time. At night. At least that's my opinion and I'm sticking to it. So my goal was to create a paintjob that really reflected this idea. At night the cells in your eyes responsible for colour vision (cones) just don't function, so you're left with pretty much black and white vision (rods), but that's kind of boring, so instead I tried to stay away from bright colours, and stuck to neutral and desaturated tones as much as I could. Step 1: Basecoat the bones of the skeleton in a 1:1 mixture of Adeptus Battlegrey and Dheneb Stone (both foundation paints). Try to get a nice solid colour to start with. I find if you've watered the paint down two layers is probably enough. You don't need to be too neat, just make sure you get all the bones. Step 2: Apply a wash made of a 1:1:1 mixture of Chaos Black, Codex Grey, and Graveyard Earth over the entire model. This wash mixture will get used throughout the entire process so if you plan on doing this a lot you may want to mix up a pot of it, or just find a way to keep it from drying out. Step 3: Once the wash is dry mix up a 1:1 mixture of Codex Grey and Graveyard Earth and layer it onto the bones, being careful to highlight only the upper surfaces of the bones, and leaving the recesses and lower surfaces darker. Apply a bit more of the mix to the back of the model, as for this one I've chosen the light to be coming from above and behind, you can use any direction you want, just keep it constant through your painting. Step 4: Apply another wash made of a 1:1:1 mixture of Chaos Black, Codex Grey, and Ultramarines Blue over the bones. Just apply it fairly thin and let it get into the recesses of the bones, and do its own thing. If you apply it too thick you'll tone down your last high light a lot so try not to be too liberal with it. Step 5: When the wash is dry apply a 1:1 mixture of Graveyard Earth and Ice Blue to the upper surfaces and much like in Step 3, but just try to make the highlights thinner, and leave more dark showing. Again add a bit more highlighting to the back, or whichever direction you have chosen for your light source. Step 6: Apply a 1:1:1 mixture of Graveyard Earth, Ice Blue, and Space Wolves Grey to the upper most surfaces like before. This time don't highlight all the same places as before, but try to only highlight where the moonlight would be hitting, this may take a while to figure out, but just go with what feels right and it'll turn out fine. Step 7: Now finally apply a highlight of Space Wolves Grey to only the top surfaces of the bones, and as before only do the bones that would be most lit by the moon. Ok so we're done the bones, let's move on to the leather straps and cloth. Step 1: Basecoat all the straps and leather bits with a 1:1 mixture of Adeptus Battlegrey and Khemri Brown (both foundation paints). Again aim for a nice solid colour, but now remember to be careful so you don't have to repaint any of the bone. Step 2: Apply a wash made of 1:1:1 Chaos Black, Codex Grey, and Graveyard Earth. Try not to get it on the bones too much, but remember the same wash was used early on in the bones, so if you get it where the bones and leather meet it shouldn't really change the colours too much. Step 4: Apply a wash made of a mix of 1:1:1 Chaos Black, Codex Grey and Ultramarines Blue. Apply it more or less like Step 2, just make sure it's not too thick that it tones down the highlights from Step 3 too much. Step 5: Apply a final highlight of 1:1:1 Codex Grey, Space Wolves Grey, and Bleached Bone. Apply this to only the very top of the straps much like the last highlight for the bones. Step 1: Apply a basecoat of Liche Purple. Like always a solid colour is the goal, do as many layers as needed. Step 2: Apply a pretty liberal wash of 1:1:1 Chaos Black, Codex Grey, and Graveyard Earth. Try not to be too messy at this stage. You might have to do a couple separate washes for this step, just make sure they are dry before you apply the second coat of it. Step 3: Apply a highlight of 1:1 Liche Purple and Scab Red. Try to leave some of the darker dirtier purple showing, but it's not vital at this stage to leave a lot. Step 4: Do a highlight of 1:1:1 Liche Purple, Scab Red and Ice Blue. The colour transition is a little harsh so try not to apply it too heavily. Do your best to leave the reddy purple showing in some places. Step 5: Apply a final highlight of 1:1 Liche Purple and Space Wolves Grey. Put this only on the edges of the cloth, it should be pretty bright, and you don't want to make it too bright overall. Step 6: Do a careful wash of 1:1 Chaos Black and Liche Purple only in the recesses and lower surfaces of the cloth. Try not to get it on the final highlights if possible. You really only want to clean up the shadows and where the purples meet other colours. Just a little bit more and we're done this part, so let's move on to the metals. Step 1: Apply a basecoat of Boltgun Metal to the metal bits. Again be careful and aim for a solid colour. Step 2: Apply a wash of 1:1:1 Chaos Black, Codex Grey, and Graveyard earth over the metals. Cover them completely, but don't let it pool too much. Two successive washes may be needed. Painting A Dinosaur the MadPonies way! This guide will give a quick, easy, and effective method of painting dinosaurs, lizards, lizardmen, or other figures with reptillian skin.It may work bes on fantasy figures or dinosaurs, as then no one can tell you the flesh is innaccurate. :-) For this guide I will use Deinychus figures from Copplestone Castings. 1. Starting from black primer, the lower half is done in a medium cork brown. Studying on my Lathiem: tone, contrasts, and oil paint. Hello everyone, I am presenting my last job: the splendid lathiem of La Torre (what a wonderful miniature!) It is for me a “study miniature”, where I wanted to try new techniques. Below I translate you the article that I wrote for legio pictorum. Unfortunately I speak English badly, but I hope that it is understandable although possibly full of errors. Please forgive me for this. I hope that it can be useful!